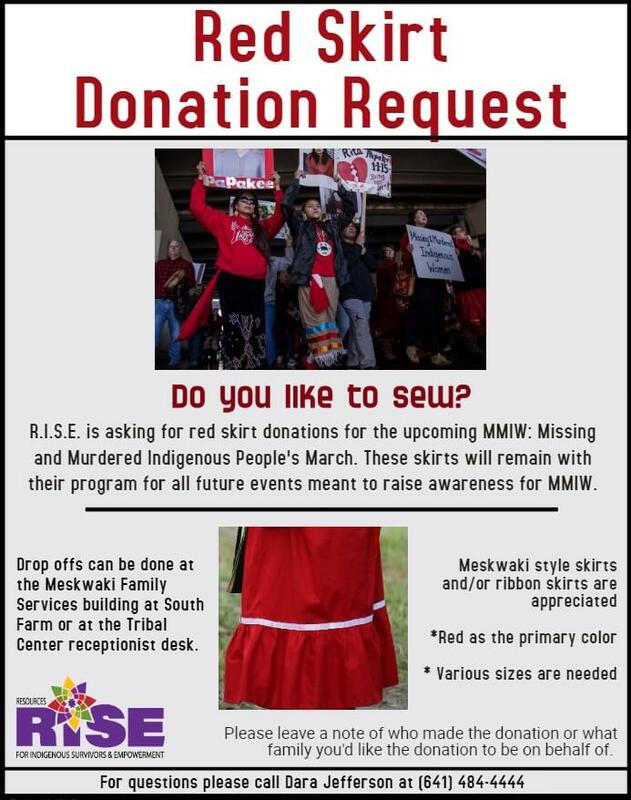 R.I.S.E received red dress and red 2-piece donations in May 2018 for MMIW events. In addition to those they are asking for red skirt donations for the same purpose, there are plans to continue efforts to raise awareness and to offer support as much as possible. Drop offs can be done at the Meskwaki Family Services building at South Farm or at the Tribal Center receptionist desk. Meskwaki style skirts and/or ribbon skirts are appreciated. Red must be the primary color and all sizes are needed. Please leave a not of who made the donation or what family you’d like the donation to be on behalf of. For questions please call Dara Jefferson at 641-484-4444.